Behind Green Eyes: Do Lidl care about Irish parents? Seemingly Not. Bit of a serious baby-related issue today instead of the usual weekly "Twin Essentials" post. I've often sung the praises of Lidl both online and in real life. I tested their nappies against other budget brands and they came out on top. I'm a huge fan of their baby wipes, their dog food (not me personally, but you know what I mean), their soft drinks. I've waxed lyrical about their CC cream, their Suddenly perfume & candles, their dark chocolate, peppermint teas, pastries from the bakery, fresh fish, chicken wings, frozen macarons - I've always loved the fact that I can get my Low Low and Dairygold in Lidl as well as all my favourites from their ranges. I've promoted their most recent baby event here, on facebook, on twitter, in reality, and I've been first in the queue to purchase baby equipment from said baby event. Unfortunately I probably won't bother with them any more after recent events. 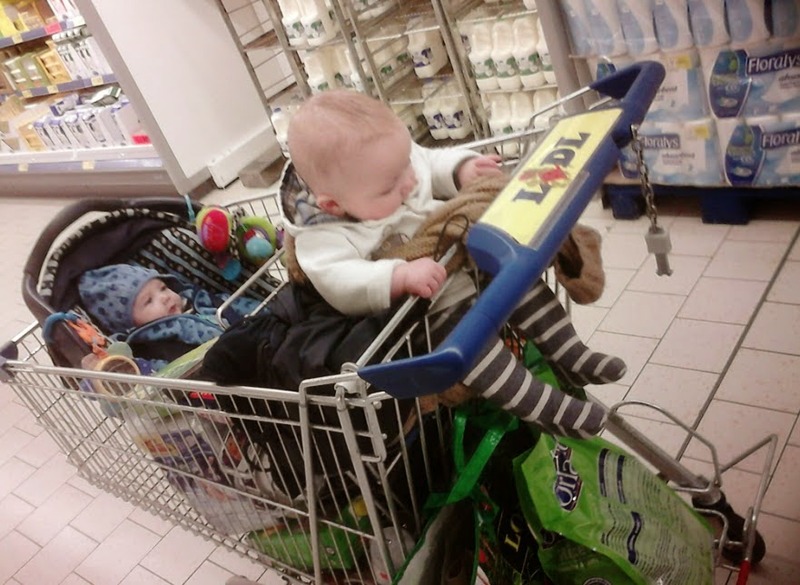 Earlier this year, the issue of not having enough twin trolleys (or any in some cases) in various stores was once again raised when I posted a picture online of one of my babies strapped into a baby seat while the other was propped up with my jacket. Up until then I'd never come across the issue but apparently lots of multiple parents had already complained due to the lack of double baby trolleys. This is the picture. This was taken in Lidl Cavan. There were no twin trolleys, but there were a few of this type, which would be suitable for a parent with a baby and a slightly older child. My boys weren't even 5 months old at that stage and Darren could just about sit up so needless to say he got incredibly pissed off after about 10 minutes sitting there and I had to carry him while pushing Edward. That, I could cope with occasionally. 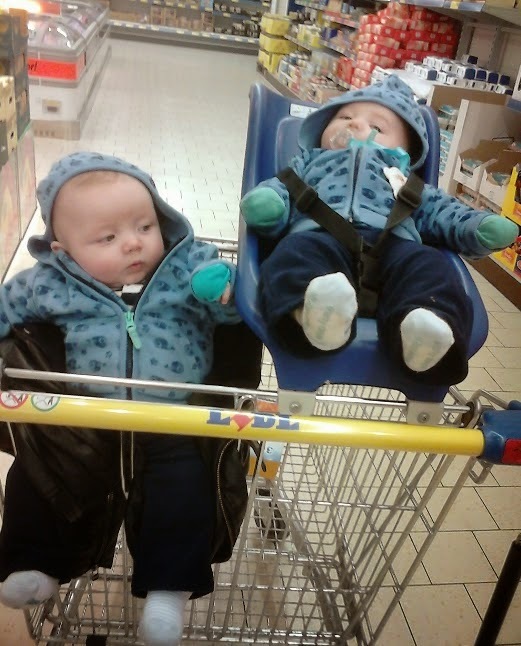 I don't know how a parent with 3 or 4 month old twins would cope - they just couldn't go into the shop without help. In Longford, we are not even lucky enough to have one with a baby seat. NOT ONE. This doesn't just have an effect on parents of twins - this means that parents with a small baby sitting in a fixed car seat can not bring that child into Lidl in Longford unless they can sit up on their own, therefore alienating the entire under 7mth bracket. I went in last Friday and here's what I had to do in order to bring both boys with me. Again Darren is the one who can sit up a little better so he was stuffed into the little seating tray (with no restraints), where I had to tie him in place with my cardigan, stuff a jacket down the side so he wouldn't fall over, and put Edward into the trolley in his carseat while trying to make sure nothing fell on top of him. I won't be in Lidl with the boys again - no matter how much I like the products. Tesco have many, many twin trolleys and baby trolleys. As do Dunnes. And Super Valu. We have other options, we don't have to try and make an effort anymore to spend money with a company who obviously place no value in parents of young children. This begs the question - why bother with the baby events in the first place? There are literally NO baby seats on trolleys in the Longford branch. None. There's a whole row of those ones you clip the car seat on to - but if you don't have an infant carrier or a seat that's easily removable then these are of no addition to you. Why not get rid of a few of those and replace them with baby trolleys? I set up a petition a while ago to try and show Lidl & Aldi (they're another lot who don't provide twin trolleys at all branches but the Longford branch does have a few baby seats) how much of an issue this is - but everyone who e-mailed them got the same generic response. We have forwarded your suggestion for twin trolleys to the Sales Operations Manager for your area. It is only on receipt of customer feedback that we are able to maintain and improve the standard of facilities offered to our customers. All customer suggestions are given consideration by the relevant personnel. As a discount retailer we must ensure that any customer suggestion we consider implementing allows us to continue to offer our customers competitive prices. Regards, [name removed] Customer Services Dept"
I'm not affiliated in any way with the Irish Multiple Births Association but I am an active member of their facebook page and have had conversations with many parents who have received the same generic response. I can not speak for the 1,112 members on that page, but a huge percentage of them agree that we need trolleys in order to take our babies with us into the shop. I mean it's all well & good providing "competitive prices" but if I have to spend an extra euro on a pack of nappies or arrange either a helper or babysitter just to go shopping, I have no problem spending that extra euro. It's not just an extra euro though, is it? Twins go through an enormous amount of nappies, wipes, baby food, sudocrem, baby porridge, rusks, powder - all of which I buy at Lidl. I do 90% of my shopping there - it consists of baby products, food & household items for an older child, two adults, and two pets. On an average week I spend €90 - €100 or thereabouts in Lidl. That's €5,200 on average per year. That's not including special buys. Or Christmas. Or Birthdays. Or other Special Occasions. Or Impulse Buys. That's just ME. One parent. Multiply that by ten. Or a hundred. Or two hundred. Or five hundred. If just half the multiple parents on one facebook group spent €80 a week in Lidl stopped going, that's a potential loss of €2,080,000.00 per year. Over two million euro not being spent in Lidl because of a bloody trolley. And I can tell you that a lot of parents would spend a hell of a lot more than €80 a week in there. I'll leave you with some comments from the petition (which you can find & sign here if you so wish, if you are asked for a donation ignore, your signature will still go through: PETITION). There are many, many more on there. Badly needed, so hard to do a decent shop when you can't use a trolley as no trolley for 2 small babies. This needs to be reviewed, it's crazy to think you can't accommodate your customers in this way. I can't shop in your store with my twin daughters without a twin trolley. I can either only do a small shop at a time or go to another retail outlet when I have both my daughters with me. Signing on behalf of all the parents who just want to get their shopping done but are restricted to certain stores because of the lack of necessary equipment. If you have better facilities for mums they would choose your store before any other. Please provide these twin trolleys. I have been unable to shop at Lidl or Aldi since having my twins. This is so important and always overlooked by retailers - would be a key reason for my choice of supermarket always. It's simple - ye provide trolleys and ye'll get our custom! Thanks in advance!! Lidl - will you LISTEN to your customers. Please. PLEASE. There isn't much point in having baby events and baby bargains when you're alienating an entire cross-section of parents. You currently have approximately 124 stores in the Republic of Ireland. All you need is 3-4 twin trolleys per store, that's less than 500 trolleys total. Is this really so impossible? Will it really impact your ability to provide competitive prices? Seriously? So, Lidl - as much as I love you, I think our affair ends here. You carry on providing your "competitive prices", while I, and others who physically cannot bring our children into the store, will continue to spend our money elsewhere. I'm afraid I won't be back until I see a change, my €5,200 a year may not make a huge difference to your bottom line but I am highly doubtful that I will be the only one passing by your door, and I'm sure Dunnes, Super Valu or Tesco will greatly appreciate the extra custom. **Update 2014*** Lidl in Longford now provide a small number of double trolleys, and as promised, I have returned to shop there. THANK YOU. This is terrible. What shockingly poor customer service! Isn't it? I never realised it was such a huge problem, it could be solved so simply. Ah feck sake, they should be absolutely ashamed of themselves. The poor babies like and it's not like you can just leave them with people every-time you have to go to the shop! If tesco and Supervalue can get these trolleys in how come Aldi and Lidl can't get off of their arses and do the same. They would increase their custom too! Stupid feckers. They're over 17lbs apiece, you're more than welcome to carry them around after me! It really would increase their business enormously. Very foolish to not supply basic equipment. I'm delighted you're making a stand on this, it's awful and I'm going to sign the petition now! Have you tried babywearing at all? A sling, or a Mei Tai or any of the various options might be helpful as an interim solution to manage. Obviously having twin trolleys available is preferable, but if you carried one baby in a sling and had the other in a baby trolley if might give a bit of flexibility. Mind you it does take practise to get used to babywearing and doing physical stuff like shopping, but its worth it if you can find a carrier that you are comfortable with.